This week’s report on hate violence against those who identify or are perceived as Muslim, Sikh, Hindu, South Asian, Arab, or Middle Eastern highlights two notable shifts in trends. For the first time, physical assaults post-election have surpassed pre-election numbers. Additionally, there has been an increase in hate incidents in the Midwest region of the U.S., with percentages close to the Western and Eastern regional percentages. 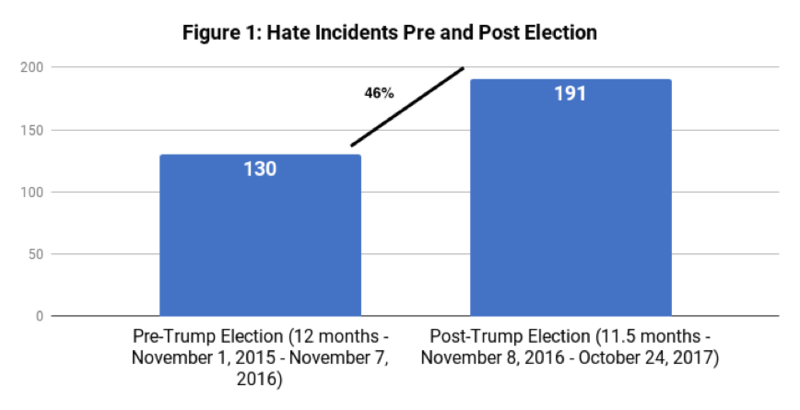 As we approach the close of the first year of Donald Trump’s presidency, the total number of hate incidents have increased to 191 resulting in a 46% increase from pre-election year to post-election year (see Figure 1). 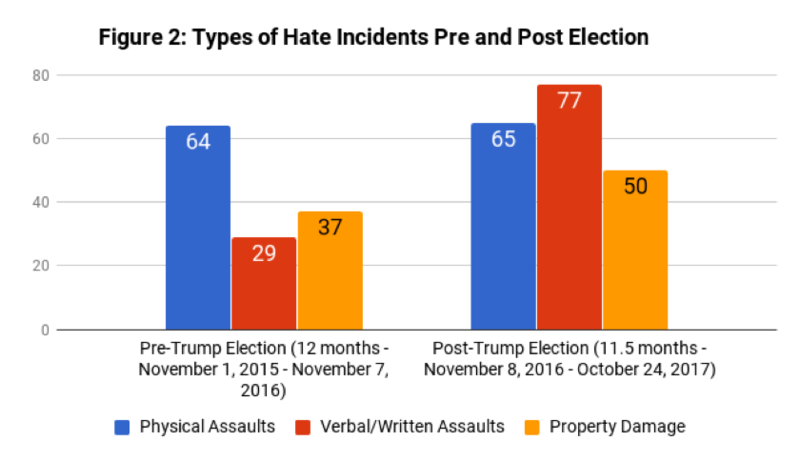 Of the 191 reported hate incidents, 65 incidents are physical assaults, 77 incidents are verbal or written threats, and 50 incidents involve property damage (see Figure 2). The most dramatic increase in hate incidents has involved verbal and written assaults over the past year. Recently, a Delaware man, Gerard Medvec, is facing hate crime charges for spying on and threatening his neighbors who he thought were Muslim. Post-election totals on physical assaults have also surpassed the totals from pre-election year. Physical assaults include acts such as shoving, punching, pulling, and spitting by the perpetrators. On October 7th, a 43-year old white man walked into a convenience store in Seattle, WA, and pepper sprayed two men and one woman wearing hijab. This attack was preceded by an anti-Muslim rant in the store. Finally, property damage often consisting of vandalism comprises the third category of hate incidents. Mosques are the most common target of hate incidents involving property damage. For example, figure 3 demonstrates that 21% of hate incidents involve damage or vandalism of mosques and Muslim community centers. This past week, Dar Al Farooq Islamic Center in Minnesota, which was bombed in August, was broken into and burglarized. 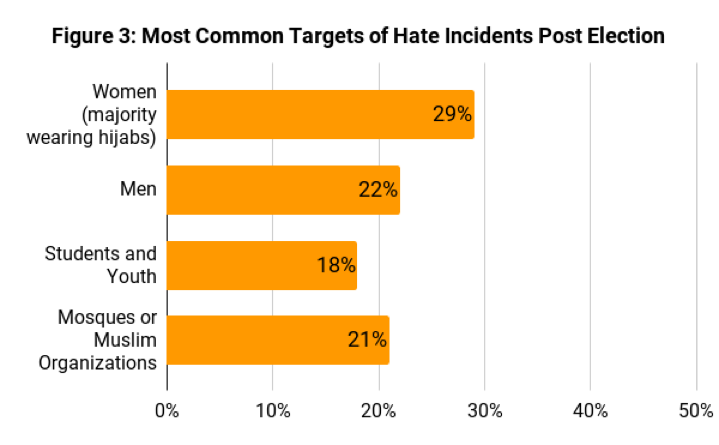 The most common victims of hate incidents are often women. Twenty-nine percent of the 191 documented hate incidents are against women who identify or are perceived as Muslim, Sikh, South Asian, Middle Eastern, or Arab (see Figure 3). A majority of these hate incidents involve women wearing hijabs. Hate violence towards women underscores the role of intersectionality and the need for identifying these intersections in documenting hate. The combination of gender, religious attire, skin color, accent, and other factors all play a part in how women are perceived and targeted in daily life. For men, as well, intersections of multiple factors contribute to how they are perceived and treated by others. Twenty-two percent of hate incidents are against men who identify or are perceived as Muslim, Sikh, South Asian, Middle Eastern, or Arab. Youth are also vulnerable to hate incidents due to the intersections of race, name, skin color, gender, and religion with young age. Eighteen percent of hate incidents involved students and youth (Youth numbers overlap with percentages of hate incidents against women and men). Incidents not only occur on the streets from strangers but also in institutional settings where others bully and haze them. A recent incident stands out in highlighting the violence that youth who identify or are perceived as Muslim, Sikh, South Asian, Middle Eastern, or Arab face regularly, and the mental health crisis that can result from that trauma. Raheel Siddiqui, a young Muslim enlisted in the U.S. Marines, committed suicide during training this past March. According to his parents, his drill instructor incessantly hazed him for being Muslim. The instructor reportedly called him a terrorist and forced him to run laps until he collapsed. Superiors denied Raheel Siddiqui medical assistance and did not take seriously his threats to commit suicide. With increasing hate violence, community groups will need to hold institutional spaces such as schools, the military, and afterschool programs accountable in creating safe space for all youth. Lastly, the rise in the number of hate incidents is regionally relevant (see Figure 4). 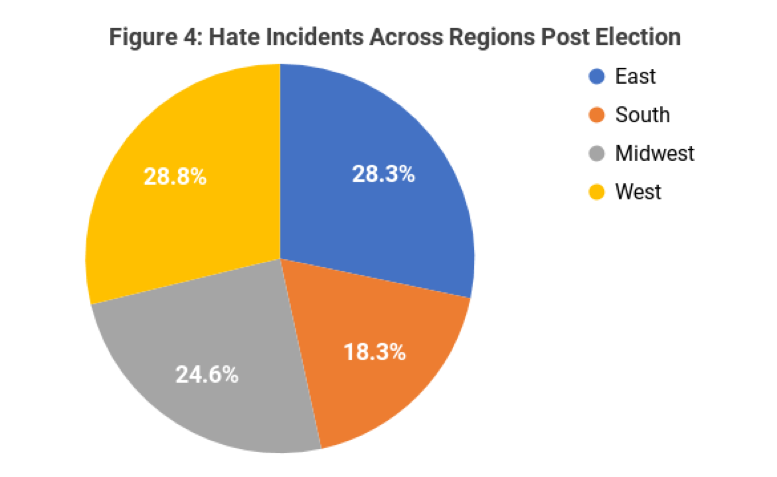 The West Coast and East Coast continue to lead in hate incidents with slightly over half of incidents occurring in those regions of the U.S. Their lead, however, has shrunk over the weeks as the occurrence of hate incidents increased in the Midwest. Currently, 25% of hate incidents have occurred in places such as Minnesota, Wisconsin, Michigan, Ohio, Indiana, and Illinois. Southern regions of the U.S. have the lowest number of incidents making up 18% of the total. South Asian Americans Leading Together (SAALT), joined 30 other national and local civil rights organizations,* including the Council on American-Islamic Relations (CAIR), in condemning Southwest Airlines’ treatment of a pregnant Muslim-American professor, Anila Daulatzai, in September. “Our organizations are appalled at the mistreatment of Anila Daulatzai by Southwest Airlines and the Maryland Transportation Authority Police (MDTA). We support Ms. Daulatzai’s demands and call for changes in policy and practice on the part of Southwest Airlines and the MDTA. “Communities of color unfortunately endure profiling at airports and on airlines on a regular basis. In fact, Muslim, Arab, South Asian and Sikh passengers have experienced a disproportionately high level of discrimination in the 16 years since September 11, 2001. ‘Flying while brown’ means that passengers are often subjected to secondary screenings, interrogations, bodily searches, and removal from airplanes for no legitimate reason at all. “Anila Daulatzai, a pregnant woman who is a Pakistani American and a Muslim, is the latest person to face this type of airline discrimination. In her case, Southwest Airlines staff insisted that Daulatzai deplane her flight because of a dog allergy even though she had made it clear that her allergies were not life-threatening. Instead of believing Daulatzai’s own statements about her physical conditions, Southwest Airlines personnel chose to escalate the situation by alerting the Maryland Transportation Authority Police (MDTA). According to Daulatzai, MDTA law enforcement agents pulled her from her seat via her belt loop, tore her pants, and dragged her through the aisle. They then allegedly made racist remarks about immigrants and charged her with disorderly conduct and other criminal charges. “Ms. Daulatzai’s mistreatment by Southwest Airlines is part of a pattern and practice of profiling. Between 2015 and 2016, over a period of just six months, several Muslim, Arab, and South Asian passengers reported incidents of being rebooked for their appearance, removed from a flight for speaking in Arabic in a private phone conversation or simply for asking to switch seats. Last year, in response to numerous incidents of profiling against our communities on Southwest Airlines flights, SAALT and our partners sent multiple communications to Southwest, including to CEO Gary Kelly, expressing concerns with their pattern and practice of racially profiling passengers. Disappointingly, all we received was one unsatisfactory response after another. As a result, SAALT terminated its 7-year relationship with Southwest and gave back $10,000 in grant funding. SAALT and our partners will continue to hold Southwest accountable until our communities are treated with dignity and equality. “SAALT applauds the decisions by Judge Derrick Watson of Hawaii and Judge Theodore Chuang of Maryland to block this administration’s latest attempt at a Muslim Ban. The highest ideals of our country are rooted in the freedom to exist without fear of government persecution. Between the two orders, the courts have proclaimed that the administration overstepped its authority in issuing a ban that ‘plainly discriminates based on nationality’ contrary to the ‘founding principles of this Nation’ and that the President’s own words on the campaign trail and on social media demonstrate this ban was explicitly intended to target Muslims. The administration has labored throughout the last 9 months to implement a ban that could withstand judicial scrutiny, but the courts have not been convinced, stating vigorously that this latest ban reflects the same discriminatory intent as the two previous bans. These bans codify bigotry and xenophobia and are out of sync with our Constitution and our nation’s values. Hate violence has skyrocketed during the President’s tenure in the White House, with white supremacist hate groups emboldened and encouraged by policies that demonize and paint our communities with suspicion. 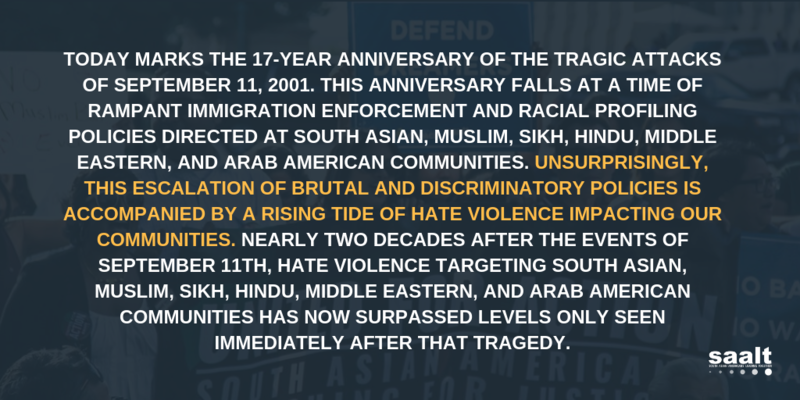 SAALT has documented over 184 incidents of hate violence aimed at South Asian, Muslim, Sikh, Hindu, Arab, and Middle Eastern Americans since the presidential elections, figures rivaling the aftermath of the September 11 attacks. Washington – This morning, a coalition of 15 organizations delivered a joint petition with over 110,000 signatures to members of Congress calling for legislation to rescind the newest version of the Muslim Ban immediately. Arab American Institute (AAI), Asian Americans Advancing Justice (AAAJ), Council on American-Islamic Relations (CAIR), Iranian American Bar Association (IABA), Muslim Advocates, Muslim Public Affairs Council (MPAC), National Immigration Law Center (NILC), NIAC Action, National Network for Arab American Communities (NNAAC), Public Affairs Alliance of Iranian Americans (PAAIA), and South Asian Americans Leading Together (SAALT). The petition was delivered to the offices of Senator Chris Murphy (D-CT), Senator Mitch McConnell (R-KY), Senator Chuck Schumer (D-NY), and Senator Diane Feinstein (D-CA). Today also marks the day that the September 24 presidential Proclamation, commonly known as Muslim Ban 3.0, was set to go into effect. To avoid a repetitive cycle of new versions of the Muslim Ban, the 15 organizations are calling on Congress to “fulfill their duties and immediately pass legislation to rescind the unconstitutional Muslim Ban and make absolutely clear that such attempts to target Muslims, or anyone on the basis of national origin, are unlawful. “SAALT has vocally supported the passage of a clean DREAM Act since the Trump administration’s decision to terminate the Deferred Action for Childhood Arrivals (DACA) program on September 5, 2017. In demanding a clean DREAM Act, we are stating unequivocally that any legislation must not include measures to increase border or interior enforcement, no cuts to family immigration, and no threats to legal immigration. All of these unacceptable provisions were included in the Administration’s priorities list issued this weekend. Specifically, these ‘priorities’ include ramping up border and interior enforcement, including the construction of a wall along the Mexico border, a further crackdown on sanctuary cities, an extreme cap on refugees and asylum seekers, and a deep slash to family and legal immigration numbers. It is a patently false construct to assume that ramping up enforcement and cutting immigration from every angle is a necessary step to ensure a legislative solution, one that is desperately needed after the inhumane rescission of the DACA program by this administration. Over 27,000 Asian Americans, including 5,500 Indians and Pakistanis, have already received DACA. An additional estimated 17,000 individuals from India and 6,000 from Pakistan are eligible for DACA, placing India in the top ten countries for DACA eligibility. These individuals and families must be protected through legislation without a barrage of unconscionable measures attached therein. Immigrants are not a threat to our national security. Instead, as numerous studies have shown, they enhance our nation and give us the opportunity to live up to our ideals as a country. Moreover, two-thirds of Americans support the DREAM Act as well as over 50% of elected officials across party lines. 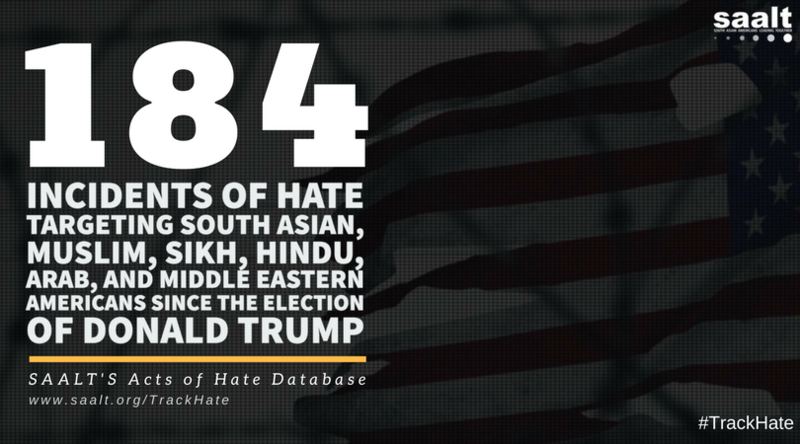 At the 11 month mark since the election of Donald Trump, there have been 184 documented incidents of hate violence against those who identify or are perceived as Muslim, Sikh, Hindu, South Asian, Arab, or Middle Eastern compared to the total of 130 from the year before the election. The rise in hate violence this year is a 42% increase from the pre-election year. Further, SAALT finds that new incidents occur at the rate of four to five a week. For example, since the last SAALT hate violence report on October 3, 2017, there have been five new reported hate incidents. Figure 2 organizes incidents of hate violence into descriptive categories and compares totals pre and post-election. The three categories of hate violence are incidents of physical violence, incidents of verbal/written threats, and incidents of property damage. Verbal and written threats and hateful rhetoric are the most common type of violence against those who identify or are perceived as Muslim, Sikh, Hindu, South Asian, Arab, or Middle Eastern. 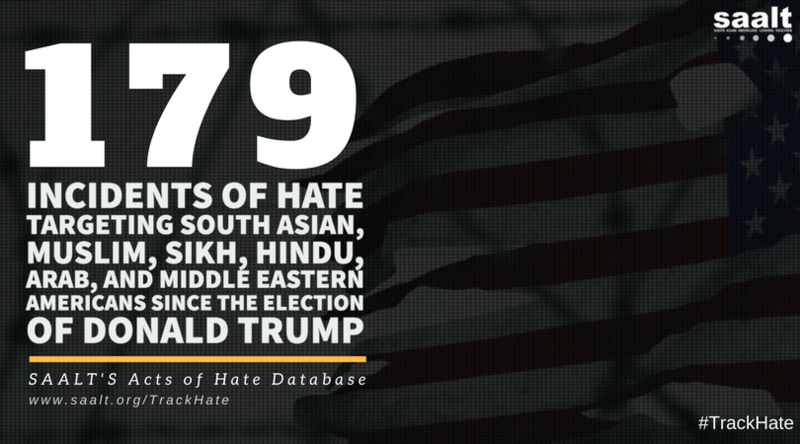 Since November 8, 2016, there have been 73 documented verbal and written hate incidents. 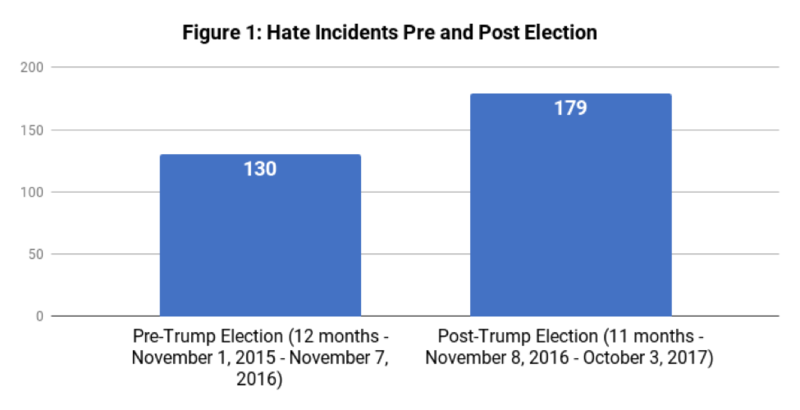 While there has been a dramatic increase in hate rhetoric over the past 11 months compared to the prior year, many verbal and written incidents go unreported. Actual physical attack due to hate and bias is the second most common type of hate violence against communities represented by SAALT. There have been 63 physical assaults in the last 11 months. This total is on par with the total from the pre-election year. Finally, property damage often consisting of vandalism comprises the third category of hate incidents with 48 unique incidents occurring since November 8, 2016. The five most recent incidents of violence occurring over the past week have targeted Muslim families, businesses, and places of worship. On October 5, Islamophobic flyers were found on the Western Washington University Campus. This is the third time in the last year that WWU has had flyers on the campus targeting communities of color. On the same day, stickers threatening Muslims were found in a government building bathroom in Portland, Oregon. A day later, on October 6, a Muslim owned store in Albuquerque, New Mexico was vandalized with the phrase “Kill em all.” Further, on October 7, a billboard for a local city council candidate in Raleigh, North Carolina,, Zainab Baloch, was vandalized with black graffiti stating “Sand N******” and “Trump.” Then two days later, on October 9, a mosque located in Farmville, Virginia had the words “F**K God & Allah” scrawled on its walls. These incidents of hate rhetoric and property damage demonstrate the spread of hate violence across the U.S. from the Southeast to the Northwest. 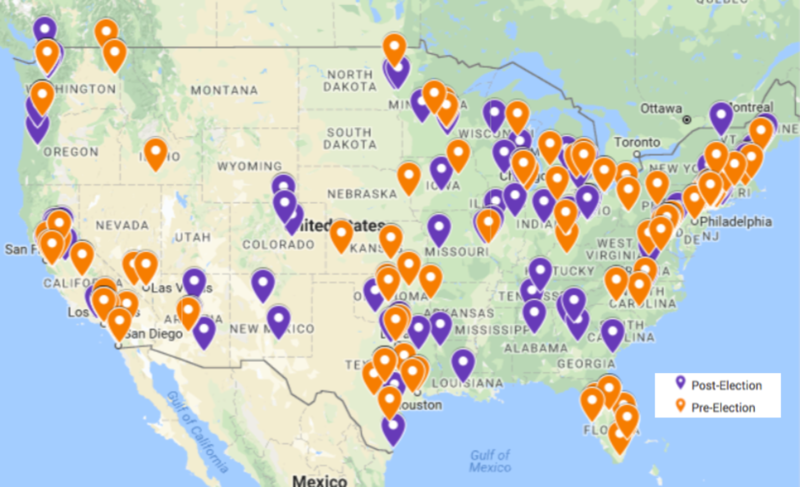 The map below illustrates the spread of hate violence across the U.S. over the last two years using differentiating pins between incidents that occurred pre-election (orange pins) and post-election (purple pins). “In response to the uptick in hate violence targeting South Asian, Muslim, Sikh, Hindu, Arab, and Middle Eastern communities around the country, SAALT is hosting regional town halls this year on key issues for our communities. SAALT thanks Attorney General Josh Stein, Senator Angela Bryant, Senator Jay Chaudhuri, Former Representative Rick Glazier, Farris Barakat, Chapel Hill Police Chief Chris Blue, the North Carolina members of the National Coalition of South Asian Organizations (NCSO), and our allies and sponsors for collaborating on this urgent town hall. Ritu Kaur – Kiran Inc. 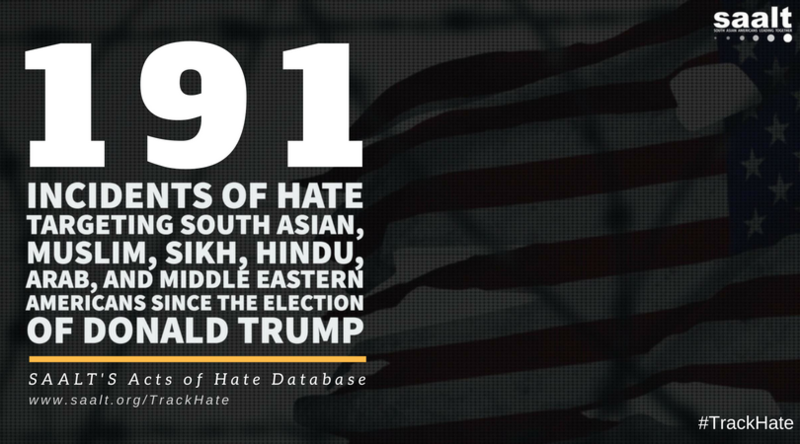 Between November 8, 2016 and October 3, 2017, there have been 179 documented hate incidents against those who identify or are perceived as Muslim, Sikh, Hindu, South Asian, Arab, or Middle Eastern compared to the total of 130 from the year prior to the election of Donald Trump. The increase in hate violence during the last eleven months is symptomatic of the normalization and sanctioning of hate rhetoric by those in positions of power and influence. Concurrent with the rise in hate incidents and normalization of hate rhetoric, there is also further deepening of institutionalized violence such as racial profiling and discrimination against multiple marginalized communities. Concurrently, the violence that is happening on the streets is also institutionalized through racial profiling and discrimination of those who identify or are perceived as Muslim, Sikh, Hindu, South Asian, Arab, or Middle Eastern. Racial profiling is a common institutionalized tactic used by law enforcement that unjustly targets and terrorizes communities of color. The ACLU reports that U.S. Customs and Border Protection (CBP) seized and searched the phones of the Alasaad family, who are Muslim and have American Citizenship, without a warrant and held the family for hours at the U.S.-Canadian border. More recently, a Muslim man was arrested, and his family was detained for three hours when he tried to deposit a check at his local bank in Wichita, Kansas. The family feels traumatized by the encounter and worries about their safety in Kansas. As hate violence on the streets and the targeting of Muslims by law enforcement are routinized, the systemic discrimination of those who identify or are perceived as Muslim also deepens in major institutions such as education, labor, or housing. A Facebook page selling and renting homes in LaSalle, Illinois, up until recently asked members interested in joining the Facebook group: “Are you Muslim or terrorist?” A private company, Verly Pro Moving Labor, set up the Facebook page and after complaints took down the question. Also, a university professor, forced to resign, is suing his former employer, University of Central Florida, on grounds that he suffered discrimination as a Black and Muslim faculty member. These are just some of the examples that demonstrate how targeting of marginalized communities is criminalized and institutionalized. Last month you heard about our efforts to speak truth to power. South Asian DREAMer, leader, and SAALT ally Chirayu Patel told elected officials at a press conference on Capitol Hill, “We will not be used as bargaining chips in political gamesmanship between the parties. It is time for Congress to make a decision on whether they’re going to support us or whether they’re going to stand in the way of progress.” You heard SAALT’s Executive Director, Suman Raghunathan, demand a clean DREAM Act, without any compromises on increased border enforcement that will negatively impact immigrant families. The Dream Act of 2017 is a bipartisan bill that would provide a path to citizenship for undocumented immigrants who came here as children, and who graduate from U.S. high schools and attend college, enter the workforce, or enlist in a military program. Last week, House Minority Leader, Nancy Pelosi, signed a “discharge petition” to bring the DREAM Act to an immediate vote in the House of Representatives. This rare Congressional motion allows a bill to be “discharged” from committee and brought to a floor vote provided that it receives 218 signatures from Members. Currently, only 23 additional signatures are needed! Call your elected officials TODAY and tell them why the DREAM Act matters to you. We urge you to target these Members of Congress and ask them to sign the discharge petition to bring the DREAM Act to a vote. Please also ask them to extend tomorrow’s October 5thDACA renewal deadline that is fast approaching. You can also call your representatives and thank them for their efforts if they are already co-sponsors of the DREAM Act and ask them to sign the discharge petition and extend the DACA renewal deadline. Participate in the National Day of Action TOMORROW, October 5th in Washington, D.C. led by our allies at United We Dream. It will begin with a press event with Members of Congress at 10 am on the South Senate lawn on the Capitol grounds, followed by visits to Member offices to demand a clean DREAM Act. Can’t join in person? Follow along and support the National Day of Action online using this digital toolkit. “I am calling today to urge you to sign the discharge petition on the bi-partisan DREAM Act of 2017, HR 3440. As a South Asian American constituent and an American deeply invested in immigration reform, I am urging you to sign the discharge petition to bring the DREAM Act to the House floor immediately for a vote. Our DREAMers only have until tomorrow October 5thto renew their DACA status and we are asking that you extend that deadline. This legislation would allow our DREAMers who are as American as you or me to remain in the only country they have ever known or called home. You may be surprised to know that there are at least 450,000 undocumented Indians alone in the U.S., and there are at least 23,000 Indians and Pakistanis who are eligible to remain in the country, be shielded from deportation, and legally work through the DREAM Act. As you may know the President recently decided to end DACA, a program which enjoys overwhelming bi-partisan support among elected officials and American voters (76%), with the stroke of his pen, putting 800,000 DREAMers’ lives in limbo. Passing the DREAM Act will allow these DREAMers to remain in the U.S. and continue their lives without fear as they continue to be part of the fabric of our nation. The time is now to step up and demand all elected and appointed officials defend and protect DREAMers, immigrants, and all Americans.